This peak is #31 on the Height List for Washington . This peak is #81 in Prominence List for Washington .Located just to the east of Washington Pass along the North Cascades Highway, Silver Star Mountain receives less precipitation and bad weather than summits on the western side of the Cascade Crest. 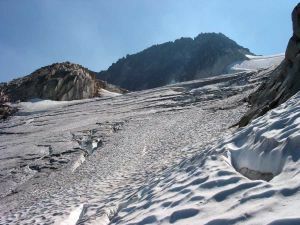 A climbers track can be picked up from along the highway which leads to the very distinct Burgundy col. From steep slopes beyond the col, the Silver Star Glacier can be accessed which provides a route to the final summit ridge, which is a scramble. This is an early season route, and is not recommended late summer or fall, due to the heavy crevasses and bergshrund which open up on the Silver Star Glacier. If this is the case, there reportedly is a scramble route from the west and then south sides of the mountain. By traversing around the mountain, the Silver Star Glacier route is picked up near the top of the glacier. The alpine rock climbing on Silver Star, by contrast, is at its best in summer and fall. For route descriptions see Beckey CAG vol III. Vasiliki Ridge is the name of the NNW spine running off Silver Star; Snagtooth Ridge is the name of the S spine, which curves east in a horseshoe to the south of Silver Star. Only one of each ridge's summits have been charted as subpeaks.